Zhao, X., Zhou, N., Lai, S., Frei, M., Wang, Y. and Yang, L. 2019. Elevated CO2 improves lodging resistance of rice by changing physicochemical properties of the basal internodes. Science of the Total Environment 647: 223-231. Rice lodging is defined as the bending or buckling of the basal internodes of the plants, which cause the stems to fall over and upon one another. It often occurs in the presence of strong winds or rain. Lodging negatively impacts rice growth and yields by reducing light interception of the plant canopy, which, in turn, decreases photosynthesis and negatively impacts carbon assimilation and water and nutrient transport into grains. Lodging can also expose plants to high humidity levels, making them more susceptible to diseases and pests, and it can reduce mechanical harvesting efficiency. To counteract and reduce the negative impacts of lodging, semi-dwarf varieties are traditionally grown in many locations across the world. These shorter plants have lower centers of gravity and are thus better able to resist lodging. However, according to Zhao et al. (2019), the potential risk of rice lodging has been increasing in recent years due to "the release of high-yielding varieties with large panicles, the increase of nitrogen fertilizer application, and shifts from labor-intensive transplanting to simplified planting techniques such as direct-seeding or seedling broadcasting." However, recognizing that "elevated CO2 alters assimilate distribution within plant organs with a higher proportion of non-structural carbohydrates being stored in culms (Yang et al., 2006), which may increase the culm strength and reduce lodging susceptibility," Zhao et al. conducted an experiment to verify if that would indeed be the case. 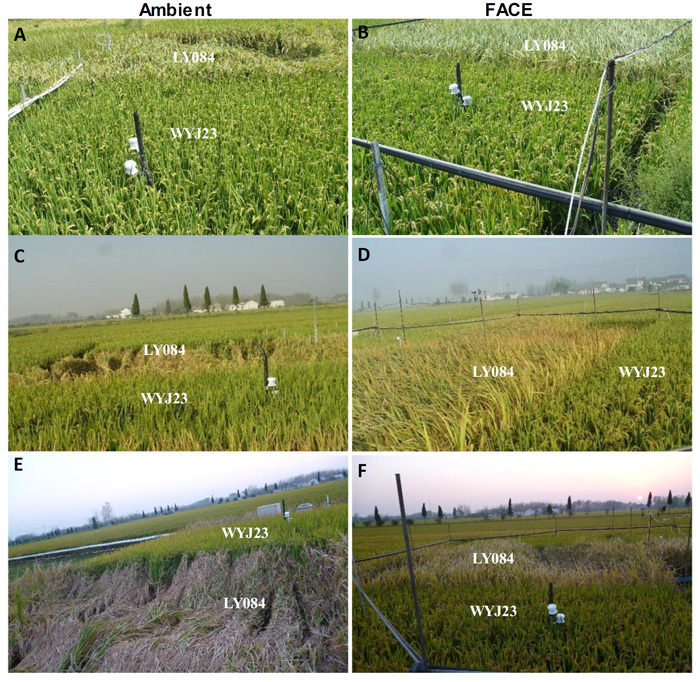 Their work was conducted in a paddy field in Xiaoji, Yangzhou, Jiangso Province, China, where they grew two rice cultivars (hybrid indica LY084 and inbred japonica WYJ23) in a free-air CO2 enrichment (FACE) experimental system over the course of a growing season. The elevated CO2 treatment was administered between sunrise and sunset and set to maintain atmospheric CO2 concentrations in the plots at 200 ppm above that measured and monitored in ambient CO2 plots. Lodging incidence (the percent of the plot experiencing lodging) remained at zero in the japonica cultivar, irrespective of CO2 concentration, which was not surprising given that this cultivar is a semi-dwarf and lodging-resistant cultivar. In contrast, the indica cultivar (which is longer and not lodging resistant) experienced lodging 32 days after heading (DAH) in the ambient CO2 plots and increased in incidence severity through harvest. Indeed, as reported by the authors, lodging incidence of LY084 was "51%, 62% and 100% at 32, 38 DAH and maturity, respectively." However, lodging only occurred at maturity in LY084 in the elevated CO2 plots and only amounted to 12% of the plants (see Figure 1 below). Another parameter related to lodging, pushing resistance, was also shown to benefit from elevated CO2, increasing by 30.6% and 39.3% in the japonica and indica varieties, respectively. Zhao et al. also report that that the "stronger lodging resistance under elevated CO2 was closely associated with changes in physicochemical properties of the basal internodes," where "the most significant change was the increase in culm density," which "was possibly caused by high amounts of starch retained in the stem." Consequently, the authors say that "less lodging incidence under elevated CO2 contributed to an increase in grain yield by 36% for LY084," as well as a modest 9% increase in WYJ23. In commenting on their many findings, Zhao et al. say that "rice production could benefit from elevated CO2 in a changing climate because of an increase in lodging resistance as a result of CO2-induced improvements in mechanical strength of basal internodes." In addition, they add that "in future environments with high CO2 concentration, the yield of hybrids [like indica LY084] may not necessarily be compromised by lodging because of increased panicle weight: on the contrary, the [greater] yield potential of hybrids may be realized because of decreased lodging risk." And that is great news for rice growers and consumers! Figure 1. Lodging incidence of two rice cultivars (WYJ23 and LY084) at three time intervals during the grain filling stage under ambient and elevated (FACE, ambient plus 200 ppm) atmospheric CO2 concentrations. Photographs A and B taken on day after heading (DAH) 26 for WYJ23 and 32 for LY084; photographs C and D were taken on DAH 32 for WYJ23 and DAH 38 for LY084; photographs E and F taken on DAH 42 for WYJ23 and at maturity for LY084. Source: Zhao et al. (2019). Yang, L.X., Huang, J.Y., Yang, H.J., Dong, G.C., Liu, G., Zhu, J.G., Wang, Y.L., 2006. Seasonal changes in the effects of free-air CO2 enrichment (FACE) on dry matter production and distribution of rice (Oryza sativa L.). Field Crop Research. 98: 12-19.